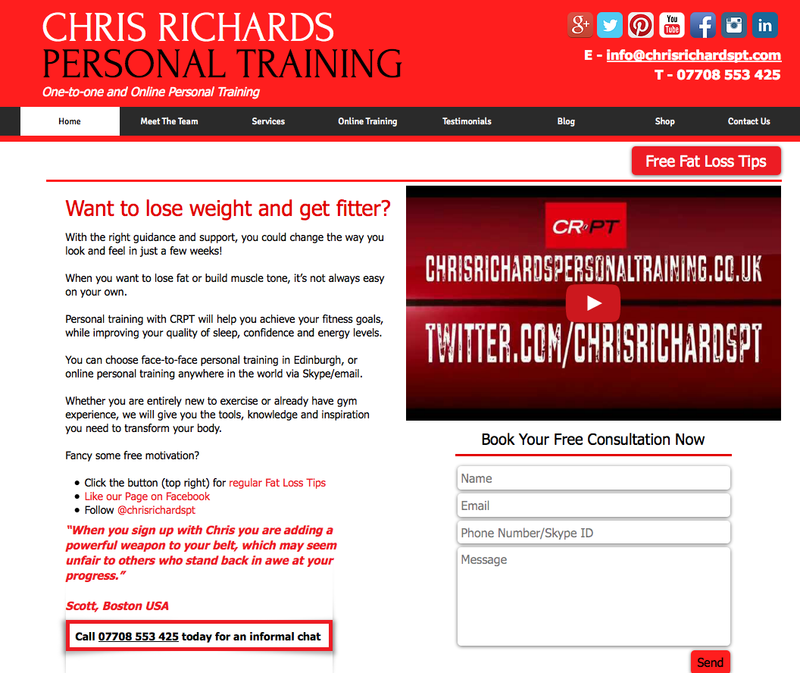 Back in October, I received an email from personal trainer, Chris Richards, who wanted to talk to me about writing some blog posts for his website. However, when I looked at his website, I could see it didn’t do him justice. The copy was too long, too ‘top down’, and being centred on a black background made it hard to read. Writing new blog posts without improving the site would be a waste of my time and his money. So we agreed a three-month programme of marketing consultancy to be implemented alongside the blog posts. After only a couple of weeks, Google Analytics showed the bounce rate* had reduced from 55.13% to 50.31%, while time spent on the site increased from 1:46 to 2:05 on average. It was apparent that the bounce rate and time spent when viewed on a mobile device were much poorer, which skewed the data. It became essential to make the site responsive (mobile-friendly), as almost half the visitors viewed it that way. By now, Analytics showed people were looking at more pages per session, on average 2.81 instead of 2.52, and staying for 2:25 – much better. Meanwhile, the mobile site was being developed. By 4 December, the mobile site was implemented. By 9 December, Analytics showed people were staying for 3:45 on average. On desktop devices, it was three times what it was with the old site, and double the time on mobiles. People who clicked through from Facebook viewed an average of 3.03 pages compared with 1.91 before I got involved, and spend 6:01 browsing the site instead of just 1:16. I think that’s what you call a healthy success! *Bounce rate means people took one look at the site and ‘bounced’ away immediately.